If you’re short on time and in need of a mouthwatering meal, this Slow Cooker Garlic-Parmesan Chicken will save the day. I’m a huge fan of anything garlic-parmesan, but this Slow Cooker Garlic-Parmesan Chicken is definitely in a league of its own. With little prep and hardly anything to clean-up, this recipe is every home cook’s fantasy fulfilled! 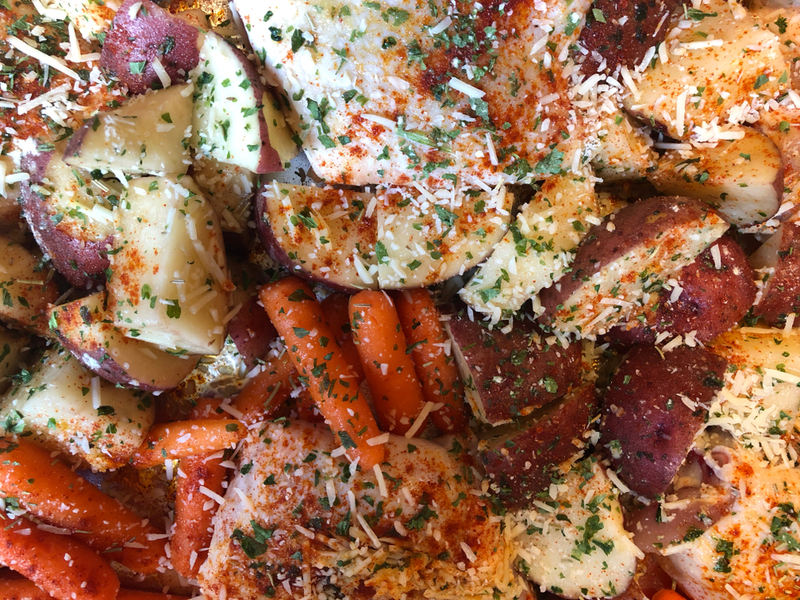 To say each bite of Slow Cooker Garlic-Parmesan Chicken is satisfying is a complete understatement. During cold winter days, our cravings for warm, comforting dinners intensify even more. However, there’s nothing more comforting than knowing your dinner is cooking away in the crockpot. Prepare to enter garlic-parmesan PARADISE with this genius recipe! I couldn’t believe how juicy and flavor-packed the chicken turned out, but I was even more baffled by how hassle-free this recipe was. The slow cooker allows the flavors to develop on a level your taste buds never even knew existed — until now. In a large skillet over medium-high heat, heat oil. Add chicken, season with salt and pepper, and sear until golden, 3 to 4 minutes, then flip and sear 3 minutes more. Meanwhile, in a 6-quart slow-cooker, toss potatoes with olive oil, garlic, and thyme. Season generously with salt and pepper. Add chicken to slow cooker and toss gently, then cover and cook on high for 4 hours or low for 8 hours, until potatoes are tender and chicken is fully cooked.